Whether you are just starting out in the event planning business or are a seasoned event planner, chances are you are familiar with an event planning checklist or have at least heard it referenced during an event planning course or industry gathering. There is a reason for that. An event planning checklist is a planner’s best friend, an invaluable tool for successfully managing your events. Note: an event planning checklist is also known as a work back schedule or a critical path. Event planning is all about the planning. Even the most creative event idea will flop if it is not well planned and executed. Here is where an event checklist comes in. It is your guide to staying organized and on -- or ahead -- of schedule when juggling the myriad of responsibilities and assorted details in planning a successful event. And it is particularly useful when managing multiple events. Forgetting one small task or falling behind on one deadline can result in a domino effect: other seemingly unrelated aspects of your event can start to fall apart, one by one. So don’t rely on your memory, sticky notes or scribbles on your pad to keep your event planning business running smoothly. Learn to put together an effective event planning checklist, and it will soon become your new best friend. To get started, clear some time from your schedule to focus on the event you are planning. Next, clear your mind. Seriously. No glancing at the phone or answering an email. You need to envision this event from start to finish without interruption or distraction so that you can effectively plan out all the tasks that must be completed. Think about the event you are planning and write down all the details that are confirmed: client name and contact information, date of the event, location, number of attendees, etc. Take out a calendar and mark the event date on this calendar in bold letters. Gather any other relevant materials – photos of the venue, list of caterers to contact – that are a part of this event. 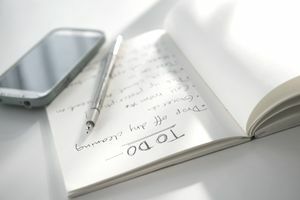 The way to start writing an event planning checklist is to work backwards. Guests experience an event as a one-day or multiple-day gathering with everything happening at once. Like a live performance that appears on the stage and is executed beautifully. Event planners view events as a series of smaller events that fit together like pieces of a puzzle to culminate in the final event. So, as planners, we start at the beginning. Which is several weeks or months before an actual event takes place. When deciding where to start in writing your event planning checklist, think about laying a solid foundation for your event. Before selecting color schemes and ordering flowers, you have to tackle the basics. From signing contracts to negotiating a block of rooms, everything needs to be written on your checklist, no matter how large or small. The key is to first take care of any tasks that can be completed in advance to allow more time in your schedule for those to-do items that occur closer to the event date. Sign contracts (with client, venue, vendors, etc.). With every item on your event checklist, add extra time. If the date to actually mail the invitations is March 15, put an item on your list to have the invitations ready for mailing March 8, one week prior. That gives you some extra time should something go awry with the invitations or if you are behind schedule for another reason. It is not enough to write “sign contract with caterer” on your checklist and then check off the box when completed. You will need to make sure that the caterer has received a copy of the contract and has returned a signed copy to you as well. So for every big item, you add to your checklist, include a reminder. For example, “Follow up with caterer re: contract.” Add another, later reminder that reads “Received signed contract from caterer.” It is not uncommon to tackle a task and consider it done when it really was only completed on your side.